Have you read a post, Looking at the Hyper-V Event Log, was written by Ben Armstrong, Principal Program Manager Lead, Microsoft? Ben talked about what event logs can be found on event viewer. In Windows Server 2012 R2, there are the following categories. Remark: There are some new categories in Windows Server 2012 and 2012 R2. This section is for anything that relates to virtual machine configuration files. If you have a missing or corrupt virtual machine configuration file - there will be entries here that tell you all about it. 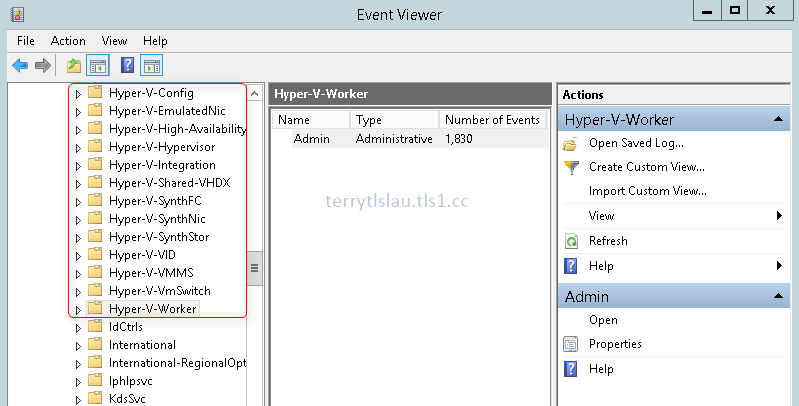 This section tells you about actions and changes that happen because of Hyper-V clustering. This section is used for hypervisor specific events. You will usually only need to look here if the hypervisor fails to start - then you can get detailed information here. This section is used by the image management service to log information about virtual hard disk operations - like creating, converting and editing virtual hard disks. If you have problems creating or editing a virtual hard disk - look here. This section is used to log events that relate specifically to integration services. This section is used for events relating to virtual networks. You will see information about the creation and configuration of virtual networks here (as opposed to virtual network adapters). This is the section where information about virtual network adapters. You will see entries in here each time a virtual machine with virtual network adapters powers up. You will also see entries here if a virtual machine fails to power on because of a configuration issue with its network adapters. This section is to do with virtual hard disks that are associated with running virtual machines (it is the storage equivalent of the SynthNic section). This section is where the virtual machine management services files its events. This section is used by the worker process that is used for the actual running of the virtual machine. Ben provided the troubleshooting tip like starting with Hyper-V-VMMS to trace the error message. It's very useful for Hyper-V administrators to find out problems.